Posted on Wed, Feb 8, 2012 : 10:11 a.m.
Newsstand sales of magazines plummeted in the second half of 2011, corresponding with the liquidation of Ann Arbor-based Borders Group Inc., formerly the second largest bookstore chain in the U.S.
Single-copy sales of consumer magazines fell 9.96 percent in the last six months of 2011, compared with the same period in 2010, according to Audit Bureau of Circulations figures released Tuesday. The report marks the first period in which most Borders stores were closed. The retailer, known for carrying a wide selection of magazines, announced its liquidation on July 18 and stopped carrying new magazines at the same time. Individual copies of magazines like Inc. Magazine are harder to find after Borders liquidated. 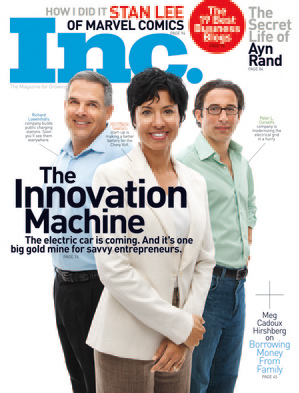 This copy featured Ann Arbor entrepreneur Ann Marie Sastry. But the impact of Borders' demise on the sale of magazines was barely mentioned in national media reports. Among the other culprits are digital magazine subscriptions through devices like Apple's iPad, for example. “It’s not just technology. It’s the proliferation of media,” Steven Cohn, editor of the Media Industry Newsletter, told the New York Times. Readers are flocking to "many online portals and social media services like Twitter and Facebook" to get news they used to get from magazines, the Times reported. Here's a link to the ABC figures. Read a story by Forbes here. Thu, Feb 9, 2012 : 12:30 p.m. I used to enjoy browsing the newsstand at Border's, and I even bought one from time to time. At $5, $6, or more a pop, though, I must admit that I'd been buying fewer in recent years. Is there a newsstand downtown any more? Can you buy magazines at CVS or 7-11 or maybe that party store on S. State? Wed, Feb 8, 2012 : 11:27 p.m.
We just saved 10 million trees. Wed, Feb 8, 2012 : 8:51 p.m. It's hard to fold out the centerfold on my Kindle. Wed, Feb 8, 2012 : 7:49 p.m.
Heck, I get my Readers Digest on my Kindle now! I am gradually quitting all my print magazines as they expire. I can also keep them on my reader. Wed, Feb 8, 2012 : 7:25 p.m. I find it hard to buy Buggy Whips, Horse Shoes and Frozen Cubes of ice for my Ice Box also. I guess that is what they call progress. Fri, Feb 10, 2012 : 12:53 a.m. Frozen Cubes of ice for your Ice Box? Clarence Birdseye helped develop and promote the idea of refrigeration. Yes, the frozen vegetable brand is named after him. Wed, Feb 8, 2012 : 6:47 p.m.
Kind of surprised anyone buys magazines off racks. Subscription rates on some are real low, so low I keep wondering if it is a last ditch effort to stay afloat financially. Have been offered some as low as $1 an issue. Wed, Feb 8, 2012 : 5:16 p.m. I have no where to buy my mags anymore especially international ones. I tried Nichola's but they didn't have the ones I used to get at Borders. Thu, Feb 9, 2012 : 12:01 p.m.
Nocola's will special order for you. I recieve my magazine from Italy that they order for me, no problem. Wed, Feb 8, 2012 : 5:08 p.m.
Photoshop Magazine: gotta have the print version because it's inconvenient to keep switching back and forth between the instructive articles and Photoshop the app. So - I got a subscription to that ONE magazine. Scientific American Magazine: different story -- Don't need to &quot;keep&quot; every article and there're no instructive articles So I get the digital subscription and download the pdf file monthly. Same with other mags I read regularly - and if I want to print any one article from them, I just hit &quot;Command + P&quot; on my Mac. The way we use / read periodicals has changed - no doubt about that. Wed, Feb 8, 2012 : 4:47 p.m.
Magazine sales have fallen at least in part because with Borders gone, there is nowhere convenient to buy the magazines. I used to buy the New Yorker at the downtown or Lohr Rd. Borders every three or four weeks. I didn't want a subscription because I don't have time to read it every week. Now that Borders is gone, the only places to buy the New Yorker are Barnes &amp; Noble or Nicola's, neither of which is convenient for me to get to, so I end up almost never buying it at all anymore. Borders is much missed. Wed, Feb 8, 2012 : 9:49 p.m.
We haven't been to Nicola's as we tend to shop and store-browse in the downtown area, but hear great things about it. Dear Nicola owners: there is a large vacant property on the corner of Liberty and Maynard streets which was formerly occupied by a bookstore. Please move there, and we promise to visit regularly and buy magazines and books, and you will be doing a great community service for our town! Yes, Nicola's at West Gate , great selection there. I think as good as Borders and the best collection of wood working magazines I have ever seen anywhere. Wed, Feb 8, 2012 : 5:07 p.m.
@Chipper, I've had a similar experience. With Borders gone, there are very few businesses selling a wide cross section of magazines.